The most vital aspect of managing a successful archival project is identifying the right problem to be solved. In the cultural heritage sector, too many excellent exciting projects exist, but limited resources hamper seeing them to fruition. 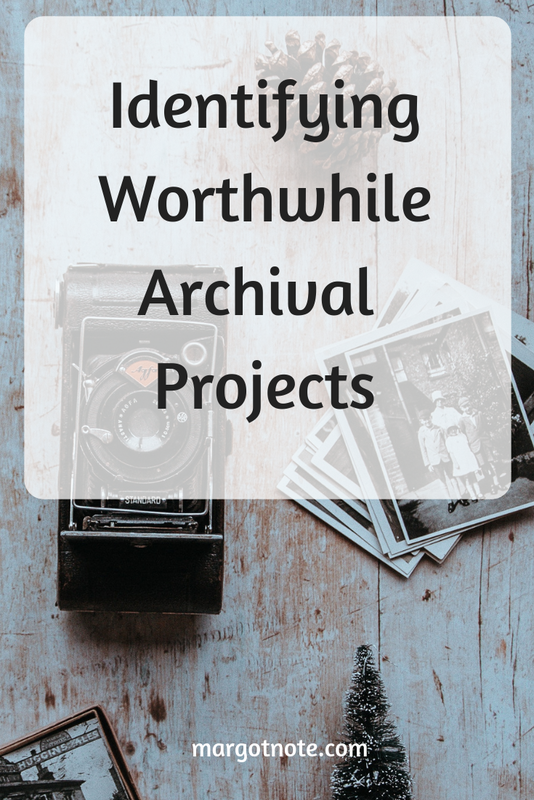 Archivists should prioritize projects that add value to the organization. The proposed archival project should align with the organization’s strategic goals and priorities. If it fails to do so, the effort risks wasting time and resources that should have been applied to more important priorities. Activities that identify, analyze, and improve existing processes are often excellent candidates for projects. As you plan projects, think of ways in which you can deliver services faster and more easiliy, with less work. Process measures examine the efficiency of procedures (throughout the day) that use resources, primarily staff time. These are common in information centers like libraries, archives, and museums where value-added services and experiences are appreciated. Consider project suitability as well. The right projects satisfy three simple but necessary criteria. They first address an established need. They then are shown to be worthwhile financial investments. Finally, they rank among the best opportunities. Many projects are good ideas, but archival organizations should only implement the best, appropriate, and impactful projects. Explore potential projects by creating a business case for them, analyzing the many opportunities they could provide the organization. The business case is a justification for a proposed project based on its expected benefits. It describes success regarding measurable positive results. It includes the issues to be addressed, the goals for undertaking such a project, and the project’s objectives. The project sponsor, someone in a leadership position that champions your work, is often the best person to develop the business case because he or she will handle delivering a successful outcome. Archivists who will also be project managers may help to develop business cases as well because it allows them to become familiar with the project they will run. It is also necessary to be involved in the business case since it will secure needed project resources. Senior executives should approve the business case once it is completed. A SWOT analysis—a review of the internal and external environments to determine its strengths, weaknesses, opportunities, and threats—is helpful for determining the business case. Strengths and weaknesses are environmental factors internal to the organization; opportunities and threats address external issues. This analysis is a classic tool used in strategic planning. At the project level, it provides a rationale for the project, or it may uncover information that matches the organization’s resources and capabilities to the environment in which it operates. Another similar assessment technique is the PEST (political, economic, social, and technological) analysis or the extended version, PESTEL, which adds environmental and legislative aspects. This procedure is helpful when conducting a strategic study of factors that an organization needs to take into consideration when selecting projects. If the project is large or innovative, a feasibility study may be required before beginning the detailed work of planning and implementation. A feasibility study takes into account the variables of the project, including budget, resources, and time constraints, and determines the likelihood of completion given the available resources. It aids you in determining the validity of a proposed project or a section of the project. You may also be tasked with writing a feasibility study to examine the economic aspects of the project. If a project can be done in many ways, a feasibility study can clarify the best option to achieve the objectives. It can also help determine if the project is unachievable. Feasibility studies are written with upper management in mind. As you draft it, explore how the proposed project will benefit the organization. The study usually includes an executive summary, the purpose, a description of the options assessed, assumptions, the potential audience, financial obligations, and recommended actions. Each section should be brief and provide supporting evidence. Archivists should recognize the authority, political standing, and aspirations of senior executives during the project selection phase. Influential stakeholders are likely to get their projects approved based on who they are. During my experience as a “lone arranger” at a nonprofit, as well as my current work as a consultant, I have found that some projects move forward quickly, based on the power wielded by the stakeholders. This can be both a blessing and a curse. The authority granted by a high-level person in an organization who backs a project can allow funding and resources to flow more quickly and can break through internal roadblocks. On the other hand, some ill-conceived projects are set in motion, even though they probably should not. While business cases and feasibility studies enlighten some stakeholders, if an executive in the organization champions a project and has enough influence to get it approved, there may be little to do except to implement it. In this case, as project manager, you can apply processes to make the project as successful as possible given the circumstances. I started to explore project management at a time that I was employed as a subject matter expert on two projects that seemed doomed from the start, yet had to be completed because of executive pressure. In both circumstances, I voiced my concerns when required, performed my tasks for the project as well as I could, and let the project lead and sponsor take care of the rest of the problems. A proposal is the first step to launching a project. It includes the vision of the project that the stakeholders authorized for completion. The proposal is a necessary fiction because it is an idealized version of what the project could be. It contains both the intellectual vision for the work and a plan for its completion. It is impossible to know for sure what future steps and technologies will be appropriate to complete any deliverables. In transforming the proposal into a plan, archivists need to be flexible. The pace of change in technology means that once the work begins, there may be better means to do the tasks. Yet, the proposal allows you to envision how you will complete your noble archival project.